Wellness Examination: We recommend that your pet receives at least an annual examination every year. Because your pets do not communicate verbally and do not always show signs of disease until late in the disease process, an examination allows your veterinarian to look for signs of disease at a time where prevention or treatment is most effective. Wellness Blood Profiling: We recommend that all of our senior pets (6-8 years of age and above) receive wellness blood profiling. As our pets age, we begin to see some common diseases such as chronic kidney disease, liver disease, and thyroid disease. 20% of dogs and cats 7 years and older with a normal physical exam and no clinical signs of disease seen by owners will have disease that is present on the routine blood screening. Many of these can be treated with nutrition alone to try to help prevent further disease. Routine Dental Care: Periodontal disease is the most common disease that is seen in both the dog and the cat. Not only does the dental disease cause the foul odor that you smell on your pets breath, but it can cause significant disease in other parts of the body. Routine brushing if possible is the best method of prevention. Dry food tends to be better than canned food for the teeth and chewing aids can be beneficial to help keep tartar from building up. There also are concentrates for drinking water or sprays that be applied directly to the teeth. Professional cleaning through your veterinarian is a valuable to tool to remove tartar and correct any dental disease that may be present. 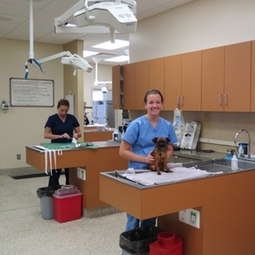 The wellness exam is an excellent time to review your dog or cats dental health. Vaccinations: Over the past decade, the veterinary profession has gained a wealth of knowledge in the area of vaccinations. We have learned information about the effectiveness, duration of immunity, and potential side effects of giving vaccinations. This has caused most veterinarians to adjust their protocols and types of vaccines as better vaccines have become available. Keep in mind that not all vaccines are equal, so ask your veterinarian why they use the vaccines that they use. Vaccine Protocol: Dogs will receive puppy vaccines around 8, 12, and 16 weeks of age. A distemper, parvovirus, and adenovirus vaccine will be given at each visit. The leptospirosis vaccine will be given around 12 and 16 weeks. Rabies vaccine will be given after 12 weeks of age. There are other vaccinations that may be given such as kennel cough or lyme vaccine. We will only give those vaccines if your pet needs them based on its lifestyle. These core vaccines will be boostered at 1 year and then the rabies, distemper/parvovirus/adenovirus become three year vaccines. The leptosporosis, kennel cough, and lyme vaccines are still annual vaccines. Cats will receive vaccines around 8, 12, and 16 weeks of age as well. Their core vaccines are herpesvirus, calicivirus and panleukopenia virus which are given at each visit. The rabies vaccine will be given after 12 weeks of age. We will vaccinate cats for feline leukemia that will be spending time outdoors. For indoor and outdoor cats, we will booster the herpesvirus/calicivirus/panleukopenia at one year of age and then will only give it each three years thereafter. Our outdoor cats will recieve the feline leukemia yearly. All cats will receive the rabies every three year unless a 1 year vaccine was given.